LIVONIA, Mich. (September 13, 2006) – After more than a year of development and real world testing on the dragstrips in NMRA competition, ROUSH Performance Products is pleased to announce that the first six products in the new Competition Line of parts are now in stock and available for purchase from the winningest Ford racers in history. Motorsports legend Jack Roush first began his career in drag racing and the earliest of his 34 national championships came in NHRA, IHRA, and AHRA competition. Roush never lost his love of the sport, and as the opportunity arose for ROUSH Performance to enter this market Roush was an eager participant and extremely "hands-on" in the development of the Competition Parts. Often seen peering under the hood of the team drag cars, his engineering background and vision is etched in the final designs of the parts that are now available for purchase. In a truly unique research-and-development process, the Competition Parts were not created solely in the lab and on computers. Instead, the designs were proven by bolting them onto a 2005 ROUSH Performance Mustang and taken into the heat of the battle during a variety of NMRA events this season. At the races, the parts were subjected to the incredible torque and demanding stress loads of drag racing, and the heavy-duty construction of each component was proven to stand up under these severe competitive applications. Each of the ROUSH Competition Parts has been developed for long-term durability. "I think one of the really unique aspects to the ROUSH Competition Parts is that they were used and tested on-track in competition and during the regular Wednesday evening test-and-tune sessions at Milan (Mich.) Dragway," explained Ryan Bunn, ROUSH Performance parts marketing manager. "We put them up to the speed and stresses of real drag racing which could never be simulated on a computer or dyno run to ensure that these parts would hold up and perform as designed for repeated race runs. If a component didn’t perform as anticipated, failed, or we saw some type of premature wear the design was modified and re-tested on the track. Many of the NMRA competitors had a chance to look over these parts while they were under development and give their input as well so the final production design is one of the most thoroughly researched and tested on the market." Bunn added that the ROUSH Performance drag racing team has logged more than 135 runs since March, each one a proving test of the Competition Parts. All the ROUSH Competition Parts are made in America and more information can be found online at www.RoushPerformance.com or by calling (800) 59-ROUSH. 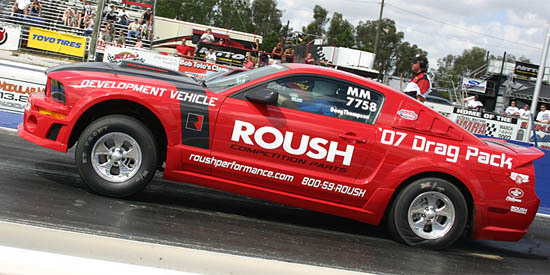 No ROUSH Competition Part is street legal or certified under federal motor vehicle safety standards or regulations. Therefore, ROUSH Competition Parts are not intended or certified for use on public roads. The second phase of the ROUSH Competition Parts line will include several more parts such as single adjustable front dampers, double-adjustable rear dampers, steel flywheel, one-piece slip yoke driveshaft, rear axle housing cover girdle, and more. Watch the web site for more information and availability.